Department of Medicine, Division of Cardiology, Emory University School of Medicine, Atlanta, Georgia. Emerging evidence suggests a link between atrial fibrillation and subsequent development of dementia. While a majority of risk can be attributed to cardioembolic stroke secondary to atrial fibrillation, additional risk is apparent, and may be driven by vascular inflammation and changes in cerebral perfusion. Medical therapies including anticoagulation, statin therapy, and angiotensin-renin-aldosterone axis antagonists may reduce dementia risk. Procedural therapies such as atrial fibrillation catheter ablation and left atrial appendage closure may also prove to be important mediators of acute and long-term risk. In this paper, we review the data supporting a link between atrial fibrillation and dementia syndromes, pathophysiologic mechanisms and the potential roles of medical and procedural therapies at reducing such risk. Key Words : Atrial Fibrillation, Dementia, Cognitive Decline, Catheter Ablation, Alzheimer’s Disease. Correspondence to: David Delurgio, 5671 Peachtree Dunwoody Rd, STE 300, Atlanta, GA 30342. Recent estimates indicate atrial fibrillation (AF) prevalence to be at epidemic levels, with further accelerated disease growth anticipated. Based upon a review from the Global Burden of Disease study,1 it is estimated that the worldwide prevalence of AF is 596.2 and 373.1 per 100,000 men and women, respectively. In developed regions of the world, such as North America, the prevalence increases considerably: 925.7 and 520.8 per 100,000 men and women, respectively. The reasons for these high numbers are multifactorial and include an aging population and an increase in prevalence of AF risk factors such as obesity and hypertension. Incidence estimates from the Framingham study, 13.4/1000 for men and 8.6/1000 for women, suggest no coming relief from this growing tide.2 Over the past 50 years, the incidence for men and women has increased by roughly 350 percent. Some effects of atrial fibrillation have been well described such as increased risk of stroke, heart failure and mortality. Dementia is an emerging novel morbidity. Dementia represents an extreme on the cognitive decline spectra and is defined as a severe deficit of multiple domains of higher central nervous function (e.g. memory, cognition, apraxia, organization, speech, activities of daily living). In its most advanced stages, dementia is characterized by severe memory loss, difficulty with activities of daily living to include eating and speaking, loss of ambulation and bowel and bladder incontinence.3 Hypertension, coronary artery disease, congestive heart failure, diabetes, and advanced age are each independently associated with AF and with dementia. The prevalence of dementia is estimated at 5 – 10 % in those aged 65 years or more, and doubles every five years after age of 65. The incidence increases with age as well, progressing from 0.1% at age 60-64 to >8% at age 95.4 Alzheimer’s disease (AD) and vascular dementia (VaD) comprise a large majority of dementia subtypes in adults over the age of 65. Considerable latency is present in AD, where brain imaging and CSF analysis may reveal elevated Amyloid β-protein (AβP) levels and plaques 20 years before clinically apparent dementia.5 While specific etiologies are implicated in AD and VaD, anatomic pathology studies demonstrate that cerebrovascular insults and degenerative findings coexist in the majority cases.6 The precise impact of cerebral infarction and secondary cognitive decline is difficult to predict, and is dependent on size, number and location of strokes.7 Therapies aimed at disease regression have been disappointing,8 resulting in increased interest in prevention by addressing modifiable risk factors: hypertension, diabetes, diet, hyperlipidemia, obesity and vascular insults, particularly earlier in life. Vascular insults include stroke, perhaps the most feared progeny of AF. In 1997, Ott et al reported the association of atrial fibrillation with dementia in a population-based study comprised of 7983 residents of a suburb of Rotterdam, Netherlands.9 Since that time, additional studies have indicated a similar risk, although causality remains a challenge to conclusively demonstrate. Several mechanisms have been proposed to explain the association between AF and dementia (see Figure 1). The association of stroke and vascular disease with dementia has been recognized for more than 25 years. Here, the causation is simple to conceptualize: local neuron death leads to loss of function. Dementia results when brain centers responsible for cognition, memory or processing lose function. Given the causal association between AF and cardioembolic stroke, a clear association of dementia and AF-associated silent and manifest stroke is not surprising. However, AF has also been associated with dementia in the absence of manifest or silent stroke.10 In these instances, other mechanisms including altered cerebral perfusion and vascular inflammation have been proposed to explain the association between AF and dementia, particularly AD.11 In this review, we will attempt to summarize the current evidence supporting an association between AF and dementia, both with and without stroke as a mediator, and the effect of medical and procedural AF therapies on reducing associated risks. Are Atrial Fibrillation and Cognitive Decline /Dementia Associated? Two recent meta-analyses have been published compiling the prospective and cross sectional studies examining atrial fibrillation and cognitive decline or dementia. Kalantarian et al. compiled 14 studies (85,414 patients), 9 of them prospective (74,358 patients) and demonstrated a weighted hazard ratio (HR) of 1.4 suggesting a modest association between AF and cognitive decline or dementia.12 The HR was similar when looking at the 8 studies specifically assessing risk of dementia (HR 1.38) or cognitive decline (HR 1.5). The association was much stronger after a history of stroke, with a HR of 2.7 compared to a HR of 1.34 when comparing cognitive decline independent of stroke history. Santangeli et al. performed a similar meta-analysis limited only to prospective studies, which were identical to the 9 prospective studies examined by Kalantarian et al, with the inclusion of a 10th study which did not report an adjusted HR for baseline abnormalities between the comparator groups.13 The HR of dementia/cognitive decline from these 10 prospective studies was 1.42 (see Figure 2). Following the publication of these meta-analyses, Rusanen et al. have provided another important contribution in the work assessing possible associations. By assessing 1510 respondents among 2000 patients randomly invited to participate from four previous longitudinal population cohort studies, the authors were able to determine relative risk of dementia with AF diagnosed in mid-life compared to that diagnosed in late life.14 The AF association with dementia was only present in the late life AF cohort. AF diagnosed in mid-life, quite surprisingly, did not predict later development of dementia. This finding is in contrast to subgroup analyses in the large prospective study by Bunch et al. where the highest association of AF with dementia was in the age group < 70yrs age, and the most commonly associated dementia type was Alzheimer’s dementia.15 A possible troubling explanation for the lack of association between AF diagnosed in mid-life with dementia reported by Rusanen et al. is the higher mortality rate noted in the Bunch cohort for younger patients developing AD or vascular dementia (HR 2.1 for both). Thus, attrition may reasonably be expected to diminish any possible association seen in the long-term follow up by Rusanen et al. Overall, the preponderance of the literature supports an increased risk of dementia or cognitive decline in patients with AF, with a HR of roughly 1.4, and which appears to be significantly higher in presence of stroke. While a relationship between AF and stroke is clear, it is interesting that evidence indicates a link between AF and cognitive decline and dementia independent of stroke. In a pooled analysis of 7 studies, AF was associated with an OR of 1.64 for development of dementia in absence of stroke.19 Similarly, patients with AF were noted to have a lower mini mental status exam score compared to a matched cohort without AF.20 While AF was independently associated with pre and post stroke dementia, AF was also associated with more silent strokes seen on imaging, number and severity of stroke and recurrent stroke.11,21 In a review of brain magnetic resonance (MR) imaging, roughly 1/4th of patients with AF were noted to have silent cerebral infarction.22 As a result, these features confound analysis. Chen et al described the importance of subclinical infarcts in predicting cognitive decline secondary to AF. In a study of 935 patients from the ARIC study without AF followed for 10.6 years, only patients with AF and subclinical infarcts on MRI imaging demonstrated higher rate of cognitive decline compared to the control cohort.21 In conclusion, the association between stroke and subsequent dementia appears to be fairly robust and provides a strong causal link between AF and dementia. 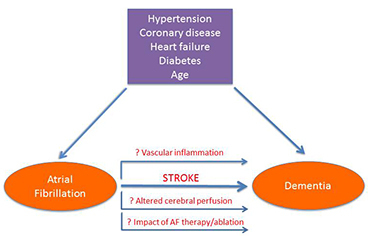 Because an increased risk of dementia/cognitive decline has been demonstrated in the absence of stroke, alterations in cardiac output have been theorized to provide an alternative mechanism by which AF might predispose to neurologic degeneration.8,23,24 Analysis of roughly 1000 Framingham cohort patients undergoing cardiac MRIs and followed for a mean of 7.7 years demonstrated a HR of 1.7 for development of dementia in patients with a cardiac index (CI) of <2.5L/min/m2. CI remained significantly associated with dementia in patients without prevalent coronary artery disease or AF, suggesting an independent mechanism.25 The underlying etiology behind this premise lies in the critical importance of unfettered cerebral perfusion to overall brain function. Local neural activation leads to increased local cerebral blood flow, in a manner akin to capillary recruitment dependent autoregulation seen in skeletal muscle.26 It has been noted that white matter hyperintensities, lacunar infarcts and medial temporal lobe atrophy are found more frequently in patients with reduced CI.8,27 Medial temporal lobe atrophy and reduced metabolic activity is associated with mild cognitive decline, a precursor for AD.28 From a cellular level, chronically reduced cerebral perfusion is associated with local acidosis and increase in oxidative balance. These features lead to dysregulation of tau protein, ultimately leading to hyperphosphorylation and development of tau oligomers and, later, neurofibrillary tangles.29 Chronic hypoxia is also associated with alteration in blood brain barrier permeability. Reduced clearance of AβP25 with secondary development of AβP plaques, secondary to a dysfunctional blood brain barrier is postulated as a primary etiologic mechanism for the development of AD.30 Tau protein neurofibrillary tangles compromise the second major histopathologic finding of AD. Thus, it comes as little surprise that reduced cardiac index has been linked to dementia and AD in cross sectional study. Atrial fibrillation has been postulated to impose additional demands on the autoregulation process via direct loss of cardiac output from lack of atrial contribution to systole and from variability in RR intervals with resultant changes in ventricular loading and electromechanical coupling. As such, AF may act to independently worsen cerebral hypoperfusion injury, especially in the elderly, where cerebral autoregulation might already be impaired. There are a few studies available that have directly measured of cerebral perfusion in presence or absence of AF. Alosco et al performed thorough cognitive evaluation and middle cerebral artery Doppler evaluation on a cohort of 186 heart failure patients, of whom roughly 1/3rd had AF.31 They found that the AF patients had lower cognitive testing scores in all domains assessed (global, executive function, memory, language) despite similar left ventricle ejection fraction (LVEF) (35-40%) and beta-blocker use. They noted that the cerebral blood flow velocity, as a surrogate for global cerebral perfusion, was significantly lower in the heart failure + AF cohort when compared to the heart failure without AF cohort. This relationship remained after adjustment for confounding variables and does provide support for abnormal cerebral perfusion in AF patients, although perhaps more readily identifiable in those with significant impairment to cerebral perfusion reserve i.e. systolic heart failure. A second, cross sectional study of 952 healthy men from Sweden demonstrated that AF was associated with subcortical frontal lobe and executive functional decline, independent of stroke, hypertension or diabetes; however, treatment with digoxin in the AF cohort (n=44) mitigated the increased risk.32 It is plausible that these findings might be reflective of reduced RR variability in AF following digoxin treatment, which would further support the role of cerebral perfusion derived insults in AF as a possible mechanism for secondary cognitive decline/dementia. Perhaps the most robust data comes from a 10 year prospective study originally designed to study the impact of ventricular rate on the progression of cognitive decline in patients with baseline mild cognitive impairment.33 Among 358 patients (mean age 74),44 developed AF. Ventricular rate was assessed as moderate (between 50 and 90) or low/high (lower than 50 or higher than 90). While AF was associated with progression of cognitive decline, it was more dramatically linked with low/high ventricular rate, with a HR of 7.7. This data would suggest that any significant deviation away from the normal heart rate where optimal diastolic and systolic loading would occur might be sufficient to perturb cardiac output and illicit chronic hypoxia and deterioration. A sub-study from the AFFIRM trial,34 however, demonstrated findings that contradict a perfusion model of atrial fibrillation induced cognitive decline.35 In a study of 245 patients randomly selected to undergo MMSE periodically through the trial, no difference was found in the rhythm control arm vs. the rate control arm when analyzed by treatment intention or adjusted for actual rhythm. Although power may have been lacking to detect a difference in MMSE results associated with rhythm vs. rate control, the AFFIRM sub-study results do not support a model of altered cerebral perfusion based on the presence of AF. Thus, while macroscopic changes in brain size and cognition have been correlated with low cardiac index,27 and well-developed etiologic pathways are described to associate AF with cognitive decline via altered cerebral perfusion, there are mixed clinical data in support of the theory. Additional data are needed to clarify the role of atrial fibrillation in cerebral perfusion abnormalities and cognitive decline/dementia. Vascular dementia, as its name suggests, derives from the net result of multiple vascular insults. Recent evidence supports an early and crucial role for vascular factors in AD. Thus, for these two etiologies of dementia, compromising a majority of the cases occurring in the older adult population, a vascular model has developed. Specifically, vascular inflammation and endothelial dysfunction have been implicated as key events allowing for onset of clinical cognitive decline and dementia. AβP plaques are associated with up-regulation of IL-1, IL6, and TNF-α, and the levels increase with disease severity.36 Clarifying cause vs. effect is observation of glial activation even prior to AβP plaque formation. Direct disruption of the blood brain barrier secondary to local extracellular deposition of AβP (amyloid angiopathy) further exposes the CNS to a wider host of pro-inflammatory mediators.5 Atrial fibrillation is associated with, though not necessarily caused by, a pro-inflammatory systemic milieu, including postoperative AF and lone AF.37-39 It has been postulated that increased permeability of the blood brain barrier along with increases in activated monocytes, prostaglandins and other pro-inflammatory mediators may act synergistically to hasten progression of dementia in the vascular model.40 Thus, while it has not been determined definitively that the increased systemic vascular inflammatory cytokines noted in AF would hasten progression of cognitive decline, a common pathophysiologic pathway exists between the two allowing for a compelling clinical model. Similar changes are noted to result from local reactive oxygen species formation in response to hypo-perfusion. Sequestration of nitric oxide and up-regulation of endothelin lead to decreased vascular compliance and additional loss of auto-regulation reserve in areas of vascular inflammation and endothelial dysfunction, which are driven in part by hypoxia and hypo-perfusion. Thus, an etiologic and epidemiologic association for vascular inflammation and oxidative stress exists for atrial fibrillation and both VaD and AD. Assessment of dementia incidence following wider adoption of novel oral anticoagulation (NOAC) agents should further clarify the role of anticoagulation in development of dementia. Compared with warfarin therapy, several agents are now available which demonstrate at least non inferiority for stroke prevention compared to warfarin with similar or improved safety profiles.43 These drugs have not been studied specifically for impact on long term cognition. A prior study demonstrated an additive benefit of direct thrombin inhibition using nautrally occuring hirudin combined with donepezil in AD patients.44 The benefits were noted to dissipate during washout of the hirudin. Thrombin upregulation has been demonstrated in patient’s with AD, and thrombin inhibition has been shown to reduce CNS inflammation in animal models.45 Such data has not been presented with Factor Xa, thus dabigatran may be an attractive agent for future study. Presently, however, insufficient data is available to comment definitively on the role of NOAC agents in reducing risk of dementia. Statin therapy exerts pleiotropic effects predominantly modulating vascular inflammation and reduced oxidative stress.46 The impact of statin therapy on dementia rate is informative in assessing the role of vascular inflammation on AF associated dementia.47 In a large review of a national database of more than 50,000 Taiwanese patients, the use of a statin was associated with a small reduction in risk of non-vascular type dementia.48 This study was limited secondary to increased rates of warfarin, aspirin and clopidogrel use in the statin treated arm. A small study assessing atorvastatin and ezetimibe therapy in patients with AF showed improvement in measures of cognition and better preservation of medial temporal lobe size.49 Similar results were noted in a second, small study of 34 patients again treated with combination atorvastatin and ezetimibe. In this study (mean age of 73), markers of inflammation were reduced and measures of cognition were improved after 1 year of treatment with the combination therapy.50 The seemingly positive effects of statin based therapy on brain function, volume and dementia progression, including non-vascular dementia, would further support a role of pro-inflammation and oxidative stress. As it is also demonstrated that levels of inflammation rise during AF episodes, there is at least reasonable expectation that this pathway might be more than simply an epiphenomenon. While design and execution of clinical trials to further explore this are challenging, this remains an area of active research. The ONTARGET and TRANSCEND trials studied the impact of angiotensin conversion enzyme inhibitor (ACEI) and angiotensin receptor blocker (ARB) therapy on cardiovascular outcomes in at risk patients.51 In total, over 31,000 patients were enrolled in these studies, and a subset underwent additional MMSE testing periodically through the median follow time of 56 months. In this study, lack of ACEI or ARB therapy was associated with an increased mean HR for development of a decrease in MMSE by ≥ 3 points, dementia, loss of independence or admission to long term care facility, though none of these HRs reached statistically significance. Atrial fibrillation catheter ablation (AFCA) has emerged as an important treatment option for management of symptoms in patients with AF, particularly among those with symptoms refractory to pharmacologic therapy. Clinical data suggests that AFCA is superior to continued pharmacologic therapy;52-54 however, AFCA is associated with important procedural complications, some of which may have an impact on cognitive outcomes. The introduction of catheters into the left atrium and the creation of pro-thrombotic ablation lesions may create a nidus for embolic peri-procedural transient ischemic attack and cerebrovascular accident (TIA/CVA). Large registry studies have demonstrated that the incidence of symptomatic peri-procedural TIA/CVA associated with AFCA is approximately 0.5-1%.55-58 Fortunately, the long-term prognosis for cognitive and functional recovery among those who experience a symptomatic TIA/CVA associated with AFCA appears to be excellent, regardless of the severity of the peri-procedural event.58 AFCA has also been associated with more subtle forms of post-procedural cognitive impairment, although the incidence of subtle impairments, detected only through formal testing, is less well described. In an important study of 60 patients undergoing AFCA, the incidence of sub-clinical post-procedure cognitive impairment identified by a battery of neuropsychological testing was significantly higher among those undergoing AFCA at both 48 hours and 90 days post procedure, compared to control patients undergoing ablation for supraventricular tachycardia (SVT) or AF patients awaiting AFCA.59 On univariate analysis, the only predictor of cognitive impairment at both 48 hours and 90 days was duration of left atrial access, suggesting a potential role for strategies aimed at reducing the risk of thromboembolic events associated with left atrial access in minimizing adverse cognitive outcomes. Beyond 90 days, the long-term impact of such subtle cognitive decline associated with AFCA is not well defined. Lastly, in addition to clinically evident TIA/CVA and more subtle but still clinically detectable forms of cognitive impairment, AFCA has also been associated with completely asymptomatic embolic events which are only identified by brain magnetic resonance imaging (MRI) (see Figure 3). The incidence of these asymptomatic cerebral emboli (ACE) associated with AFCA has been estimated at anywhere from 7-38%, depending in part on the specific MRI protocols used to identify acute embolic lesions and also whether imaging was performed both before and after or only after AFCA.60 Much of the concern regarding ACE stems from data in non-AF patients demonstrating an increased long-term risk of dementia in those with silent cerebral infarcts (defined as T2 hyperintensity on brain MRI).61 Whether a similar association exists between ACE associated with AFCA and long-term dementia risk is unclear. A small number of studies have performed follow-up MRIs on patients with ACE detected post-AF ablation and in the vast majority of these studies, the acute MRI lesions associated with ACE regress during long-term follow-up without leaving evidence of a chronic glial scar.60 Therefore, the incidence of chronic cerebral infracts following AFCA is significantly lower than the incidence of ACE detected on MRI performed within 24-48 hours post-ablation. Limited data exists on the long-term impact of AFCA on cognitive outcomes. One large prospective registry compared outcomes in 4212 patients undergoing AFCA to 16,848 age and gender matched patients with AF who did not undergo ablation. At three years, the incidence of CVA or dementia was significantly lower among those undergoing AFCA.62 In a similar multicenter registry from the United Kingdom and Australia, the incidence of stroke during a mean follow-up of 3.1 years was significantly lower among those undergoing AFCA compared to medically treated AF patients.63 Although these data suggest that the short-term risk of emboli associated with AFCA may be offset by a beneficial effect of AFCA on long-term neurologic outcomes, the lack of a randomized control group in these studies raises concern for residual confounders, which may differentiate between AF patients who are or are not referred for AFCA. On-going randomized trials of AFCA, which are powered to assess clinical outcomes such as stroke, will hopefully provide additional data. Given the concern that AFCA may be associated with at least a short-term risk of symptomatic and asymptomatic cerebral events, a number of technical strategies have been proposed to mitigate the risk of thromboembolism associated with AF ablation including performing the procedure with uninterrupted oral anticoagulants, higher intra-procedural activated clotting time (ACT) targets, systemic anticoagulation with heparin prior to left atrial access and avoidance of intra-procedural cardioversion.60 Specific ablation energy sources may also carry different levels of thromboembolic risk, although robust data are lacking in this regard. Pre-clinical studies suggest that cryo-energy lesions may be less thrombotic than radiofrequency (RF); however, clinical studies have not demonstrated any significant difference in the incidence of asymptomatic embolic events associated with cryo-ablation compared to irrigated RF.60 In contrast, phased RF technology with multi-electrode catheters may pose an increased risk of thromboembolic events, although a number of changes to the phased RF platform have recently been introduced which may reduce that risk. The impact on cognitive outcomes of these technical approaches to mitigating thromboembolic risk has not been well validated. Because the left atrial appendage (LAA) has been identified as the source of cardioembolism in approximately 90% of non-valvular atrial fibrillation,64 LAA closure is an area of rapid development and research to reduce risk of stroke. Given that stroke is a strong effector of subsequent cognitive decline/dementia, it is certainly plausible that LAA closure might reduce subsequent cognitive impairment. The Watchman device (Boston Scientific, Natick MA) is a small transfemoral device which is delivered into the LAA and is designed to seal the LAA from the remainder of the left atrium (Figure 4). The 2.3 year follow up from the Protect AF study of the Watchman closure device showed significant reductions in composite endpoint of stroke, systemic embolization or cardiovascular death, driven by reductions in hemorrhagic stroke rates.65 The 4 year follow up, however, showed only a trend toward reduced stroke, again driven by reduced hemorrhagic strokes. Large/debilitating strokes were, however, less common in the Watchman cohort.66 Thus, it is not clear how LAA closure will impact subsequent development of dementia compared to warfarin therapy. AF has been linked to cognitive decline through numerous cross sectional population studies. Definitive association through prospective study is challenging secondary to multiple common shared risk factors. Several pathways have been offered to explain the noted association including direct neuronal cell death via stroke, altered cerebral perfusion leading to white matter loss, medial temporal lobe atrophy, and increased oxidative stress states. There is clear benefit to oral anticoagulation therapy in reducing risk of stroke and reducing risk of attendant dementia. This benefit is further correlated with time in therapeutic range in patients treated with warfarin. AFCA is noted to perhaps increase risk of mild cognitive dysfunction acutely, mainly through cerebral embolism, but the middle and long-term outcomes appear more favorable. Truly randomized data is limited in this regard; however, registry data suggests that durable establishment of sinus rhythm following ablation may improve cognitive function. Statin therapy appears to yield some benefit in improving cognitive outcomes, while outcomes of other forms of AF therapy remain unclear. Cognitive decline/dementia is an important outcome in patients with AF, with striking impact on quality of life and overall health care costs associated with management. It is important for clinicians treating AF to be aware of the association with cognitive decline for counseling and monitoring purposes and to be aware of possible means of reducing risk. Schnabel Renate B, YinXiaoyan, GonaPhilimon, LarsonMartin G, BeiserAlexa S, McManusDavid D, Newton-ChehChristopher, LubitzSteven A, MagnaniJared W, EllinorPatrick T, SeshadriSudha, WolfPhilip A, VasanRamachandran S, BenjaminEmelia J, LevyDaniel. 50 year trends in atrial fibrillation prevalence, incidence, risk factors, and mortality in the Framingham Heart Study: a cohort study. Lancet. 2015;386 (9989):154–62. Mitchell Susan L. CLINICAL PRACTICE. Advanced Dementia. N. Engl. J. Med. 2015;372 (26):2533–40. Hugo Julie, GanguliMary. Dementia and cognitive impairment: epidemiology, diagnosis, and treatment. Clin. Geriatr. Med. 2014;30 (3):421–42. DAA Greenberg, JMichael, PRoger. Clinical neurology. McGraw Hill. 2012;0:0–0. Qiu Chengxuan, FratiglioniLaura. A major role for cardiovascular burden in age-related cognitive decline. Nat Rev Cardiol. 2015;12 (5):267–77. Pendlebury Sarah T, RothwellPeter M. Prevalence, incidence, and factors associated with pre-stroke and post-stroke dementia: a systematic review and meta-analysis. Lancet Neurol. 2009;8 (11):1006–18. Gorelick Philip B, ScuteriAngelo, BlackSandra E, DecarliCharles, GreenbergSteven M, IadecolaCostantino, LaunerLenore J, LaurentStephane, LopezOscar L, NyenhuisDavid, PetersenRonald C, SchneiderJulie A, TzourioChristophe, ArnettDonna K, BennettDavid A, ChuiHelena C, HigashidaRandall T, LindquistRuth, NilssonPeter M, RomanGustavo C, SellkeFrank W, SeshadriSudha. Vascular contributions to cognitive impairment and dementia: a statement for healthcare professionals from the american heart association/american stroke association. Stroke. 2011;42 (9):2672–713. Ott A, BretelerM M, de BruyneM C, van HarskampF, GrobbeeD E, HofmanA. Atrial fibrillation and dementia in a population-based study. The Rotterdam Study. Stroke. 1997;28 (2):316–21. Thacker Evan L, McKnightBarbara, PsatyBruce M, LongstrethW T, SitlaniColleen M, DublinSascha, ArnoldAlice M, FitzpatrickAnnette L, GottesmanRebecca F, HeckbertSusan R. Atrial fibrillation and cognitive decline: a longitudinal cohort study. Neurology. 2013;81 (2):119–25. Hui Dawn S, MorleyJohn E, MikolajczakPeter C, LeeRichard. Atrial fibrillation: A major risk factor for cognitive decline. Am. Heart J. 2015;169 (4):448–56. Kalantarian Shadi, SternTheodore A, MansourMoussa, RuskinJeremy N. Cognitive impairment associated with atrial fibrillation: a meta-analysis. Ann. Intern. Med. 2013;158 (5 Pt 1):338–46. Santangeli Pasquale, Di BiaseLuigi, BaiRong, MohantySanghamitra, PumpAgnes, Cereceda BrantesMauricio, HortonRodney, BurkhardtJ David, LakkireddyDhanunjaya, ReddyYeruva Madhu, CasellaMichela, Dello RussoAntonio, TondoClaudio, NataleAndrea. 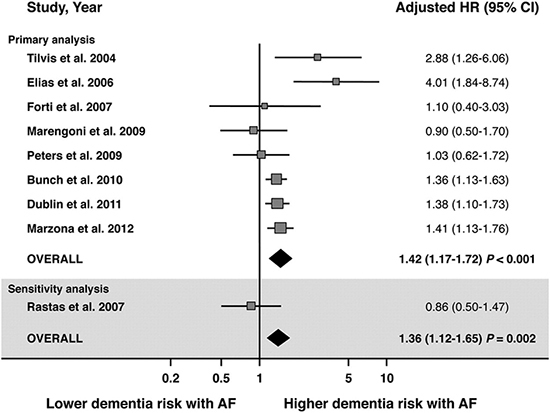 Atrial fibrillation and the risk of incident dementia: a meta-analysis. Heart Rhythm. 2012;9 (11):1761–8. Rusanen Minna, KivipeltoMiia, LevälahtiEsko, LaatikainenTiina, TuomilehtoJaakko, SoininenHilkka, NganduTiia. Heart diseases and long-term risk of dementia and Alzheimer's disease: a population-based CAIDE study. J. Alzheimers Dis. 2014;42 (1):183–91. Bunch T Jared, WeissJ Peter, CrandallBrian G, MayHeidi T, BairTami L, OsbornJeffrey S, AndersonJeffrey L, MuhlesteinJoseph B, HorneBenjamin D, LappeDonald L, DayJohn D. Atrial fibrillation is independently associated with senile, vascular, and Alzheimer's dementia. Heart Rhythm. 2010;7 (4):433–7. Mellon Lisa, BrewerLinda, HallPatricia, HorganFrances, WilliamsDavid, HickeyAnne. Cognitive impairment six months after ischaemic stroke: a profile from the ASPIRE-S study. BMC Neurol. 2015;15 ():–. Chang C J, YangJ Y. Major burns in pregnancy. Changgeng Yi Xue Za Zhi. 1996;19 (2):154–9. Ivan Cristina S, SeshadriSudha, BeiserAlexa, AuRhoda, KaseCarlos S, Kelly-HayesMargaret, WolfPhilip A. Dementia after stroke: the Framingham Study. Stroke. 2004;35 (6):1264–8. Kwok C S, LokeY K, HaleR, PotterJ F, MyintP K. Atrial fibrillation and incidence of dementia: a systematic review and meta-analysis. Neurology. 2011;76 (10):914–22. Bellomo A, De BenedettoG, FossatiC, D'OttavioE, FormosaV, GianturcoV, IoriA, MariglianoB, Lo IaconoC, TroisiG, MariglianoV. Atrial fibrillation (AF) and cognitive impairment in the elderly: a case-control study. Arch Gerontol Geriatr. 2011;55 (2):247–50. Chen Lin Y, LopezFaye L, GottesmanRebecca F, HuxleyRachel R, AgarwalSunil K, LoehrLaura, MosleyThomas, AlonsoAlvaro. Atrial fibrillation and cognitive decline-the role of subclinical cerebral infarcts: the atherosclerosis risk in communities study. Stroke. 2014;45 (9):2568–74. Vermeer Sarah E, LongstrethWilliam T, KoudstaalPeter J. Silent brain infarcts: a systematic review. Lancet Neurol. 2007;6 (7):611–9. Cermakova P, EriksdotterM, LundL H, WinbladB, ReligaP, ReligaD. Heart failure and Alzheimer's disease. J. Intern. Med. 2015;277 (4):406–25. de la Torre Jack C. Cardiovascular risk factors promote brain hypoperfusion leading to cognitive decline and dementia. Cardiovasc Psychiatry Neurol. 2012;2012 ():–. Jefferson Angela L, BeiserAlexa S, HimaliJayandra J, SeshadriSudha, O'DonnellChristopher J, ManningWarren J, WolfPhilip A, AuRhoda, BenjaminEmelia J. Low cardiac index is associated with incident dementia and Alzheimer disease: the Framingham Heart Study. Circulation. 2015;131 (15):1333–9. Paulson Olaf B, HasselbalchSteen G, RostrupEgill, KnudsenGitte Moos, PelligrinoDale. Cerebral blood flow response to functional activation. J. Cereb. Blood Flow Metab. 2010;30 (1):2–14. Abete Pasquale, Della-MorteDavid, GargiuloGaetano, BasileClaudia, LangellottoAssunta, GaliziaGianluigi, TestaGianluca, CanonicoVincenzo, BonaduceDomenico, CacciatoreFrancesco. Cognitive impairment and cardiovascular diseases in the elderly. A heart-brain continuum hypothesis. Ageing Res. Rev. 2014;18 ():41–52. Mosconi Lisa, De SantiSusan, LiYi, LiJuan, ZhanJiong, TsuiWai Hon, BoppanaMadhu, PupiAlberto, de LeonMony J. Visual rating of medial temporal lobe metabolism in mild cognitive impairment and Alzheimer's disease using FDG-PET. Eur. J. Nucl. Med. Mol. Imaging. 2006;33 (2):210–21. Liu Fei, Grundke-IqbalInge, IqbalKhalid, GongCheng-Xin. Contributions of protein phosphatases PP1, PP2A, PP2B and PP5 to the regulation of tau phosphorylation. Eur. J. Neurosci. 2005;22 (8):1942–50. Bell Robert D, ZlokovicBerislav V. Neurovascular mechanisms and blood-brain barrier disorder in Alzheimer's disease. Acta Neuropathol. 2009;118 (1):103–13. Alosco Michael L, SpitznagelMary Beth, SweetLawrence H, JosephsonRichard, HughesJoel, GunstadJohn. Atrial fibrillation exacerbates cognitive dysfunction and cerebral perfusion in heart failure. Pacing Clin Electrophysiol. 2015;38 (2):178–86. Kilander L, AndrénB, NymanH, LindL, BobergM, LithellH. Atrial fibrillation is an independent determinant of low cognitive function: a cross-sectional study in elderly men. Stroke. 1998;29 (9):1816–20. Cacciatore Francesco, TestaGianluca, LangellottoAssunta, GaliziaGianluigi, Della-MorteDavid, GargiuloGaetano, BevilacquaAgnese, Del GenioMaria Teresa, CanonicoVincenzo, RengoFranco, AbetePasquale. Role of ventricular rate response on dementia in cognitively impaired elderly subjects with atrial fibrillation: a 10-year study. Dement Geriatr Cogn Disord. 2012;34 (3-4):143–8. Wyse D G, WaldoA L, DiMarcoJ P, DomanskiM J, RosenbergY, SchronE B, KellenJ C, GreeneH L, MickelM C, DalquistJ E, CorleyS D. A comparison of rate control and rhythm control in patients with atrial fibrillation. N. Engl. J. Med. 2002;347 (23):1825–33. Chung Mina K, ShemanskiLynn, ShermanDavid G, GreeneH Leon, HoganDavid B, KellenJoyce C, KimSoo G, MartinLisa Warsinger, RosenbergYves, WyseD George. Functional status in rate- versus rhythm-control strategies for atrial fibrillation: results of the Atrial Fibrillation Follow-Up Investigation of Rhythm Management (AFFIRM) Functional Status Substudy. J. Am. Coll. Cardiol. 2005;46 (10):1891–9. Akiyama H, BargerS, BarnumS, BradtB, BauerJ, ColeG M, CooperN R, EikelenboomP, EmmerlingM, FiebichB L, FinchC E, FrautschyS, GriffinW S, HampelH, HullM, LandrethG, LueL, MrakR, MackenzieI R, McGeerP L, O'BanionM K, PachterJ, PasinettiG, Plata-SalamanC, RogersJ, RydelR, ShenY, StreitW, StrohmeyerR, TooyomaI, Van MuiswinkelF L, VeerhuisR, WalkerD, WebsterS, WegrzyniakB, WenkG, Wyss-CorayT. Inflammation and Alzheimer's disease. Neurobiol. Aging. 2000;21 (3):383–421. Parashar Susmita, KellaDanesh, ReidKimberly J, SpertusJohn A, TangFengming, LangbergJonathan, VaccarinoViola, KontosMichael C, LopesRenato D, LloydMichael S. New-onset atrial fibrillation after acute myocardial infarction and its relation to admission biomarkers (from the TRIUMPH registry). Am. J. Cardiol. 2013;112 (9):1390–5. Yao Shu-Yuan, ChuJian-Min, ChenKe-Ping, TangMin, FangPi-Hua, WangFang-Zheng, ZhangShu. Inflammation in lone atrial fibrillation. Clin Cardiol. 2009;32 (2):94–8. Takeda Shuko, SatoNaoyuki, MorishitaRyuichi. Systemic inflammation, blood-brain barrier vulnerability and cognitive/non-cognitive symptoms in Alzheimer disease: relevance to pathogenesis and therapy. Front Aging Neurosci. 2014;6 ():–. Jacobs Victoria, WollerScott C, StevensScott, MayHeidi T, BairTami L, AndersonJeffrey L, CrandallBrian G, DayJohn D, JohanningKatie, LongYenh, MallenderCharles, OlsonJeffrey L, OsbornJeffrey S, WeissJ Peter, BunchT Jared. Time outside of therapeutic range in atrial fibrillation patients is associated with long-term risk of dementia. Heart Rhythm. 2014;11 (12):2206–13. Verheugt Freek W A, GrangerChristopher B. Oral anticoagulants for stroke prevention in atrial fibrillation: current status, special situations, and unmet needs. Lancet. 2015;386 (9990):303–10. Li De-qiang, ZhouYu-ping, YangHan. Donepezil combined with natural hirudin improves the clinical symptoms of patients with mild-to-moderate Alzheimer's disease: a 20-week open-label pilot study. Int J Med Sci. 2012;9 (3):248–55. Grammas Paula, MartinezJoseph M. Targeting thrombin: an inflammatory neurotoxin in Alzheimer's disease. J. Alzheimers Dis. 2014;42 Suppl 4 ():S537–44. Sirtori Cesare R. The pharmacology of statins. Pharmacol. Res. 2014;88 ():3–11. Peña Jessica M, MacFadyenJean, GlynnRobert J, RidkerPaul M. High-sensitivity C-reactive protein, statin therapy, and risks of atrial fibrillation: an exploratory analysis of the JUPITER trial. Eur. Heart J. 2012;33 (4):531–7. Chao Tze-Fan, LiuChia-Jen, ChenSu-Jung, WangKang-Ling, LinYenn-Jiang, ChangShih-Lin, LoLi-Wei, HuYu-Feng, TuanTa-Chuan, ChenTzeng-Ji, LipGregory Y H, ChiangChern-En, ChenShih-Ann. Statins and the risk of dementia in patients with atrial fibrillation: A nationwide population-based cohort study. Int. J. Cardiol. 2015;196 ():91–7. Tendolkar Indira, EnajatMorteza, ZwiersMarcel P, van WingenGuido, de LeeuwFrank-Erik, van KuilenburgJanet, BouwelsLeon, PopGheorghe, Pop-PurceleanuMonika. One-year cholesterol lowering treatment reduces medial temporal lobe atrophy and memory decline in stroke-free elderly with atrial fibrillation: evidence from a parallel group randomized trial. Int J Geriatr Psychiatry. 2012;27 (1):49–58. Lappegård Knut Tore, Pop-PurceleanuMonica, van HeerdeWaander, SextonJoe, TendolkarIndira, PopGheorghe. Improved neurocognitive functions correlate with reduced inflammatory burden in atrial fibrillation patients treated with intensive cholesterol lowering therapy. J Neuroinflammation. 2013;10 ():–. Marzona Irene, O'DonnellMartin, TeoKoon, GaoPeggy, AndersonCraig, BoschJackie, YusufSalim. Increased risk of cognitive and functional decline in patients with atrial fibrillation: results of the ONTARGET and TRANSCEND studies. CMAJ. 2012;184 (6):E329–36. Calkins Hugh, ReynoldsMatthew R, SpectorPeter, SondhiManu, XuYingxin, MartinAmber, WilliamsCatherine J, SledgeIsabella. Treatment of atrial fibrillation with antiarrhythmic drugs or radiofrequency ablation: two systematic literature reviews and meta-analyses. Circ Arrhythm Electrophysiol. 2009;2 (4):349–61. Morillo Carlos A, VermaAtul, ConnollyStuart J, KuckKarl H, NairGirish M, ChampagneJean, SternsLaurence D, BereshHeather, HealeyJeffrey S, NataleAndrea. Radiofrequency ablation vs antiarrhythmic drugs as first-line treatment of paroxysmal atrial fibrillation (RAAFT-2): a randomized trial. JAMA. 2014;311 (7):692–700. Wazni Oussama M, MarroucheNassir F, MartinDavid O, VermaAtul, BhargavaMandeep, SalibaWalid, BashDianna, SchweikertRobert, BrachmannJohannes, GuntherJens, GutlebenKlaus, PisanoEnnio, PotenzaDominico, FanelliRaffaele, RavieleAntonio, ThemistoclakisSakis, RossilloAntonio, BonsoAldo, NataleAndrea. Radiofrequency ablation vs antiarrhythmic drugs as first-line treatment of symptomatic atrial fibrillation: a randomized trial. JAMA. 2005;293 (21):2634–40. Cappato Riccardo, CalkinsHugh, ChenShih-Ann, DaviesWyn, IesakaYoshito, KalmanJonathan, KimYou-Ho, KleinGeorge, NataleAndrea, PackerDouglas, SkanesAllan, AmbrogiFederico, BiganzoliElia. Updated worldwide survey on the methods, efficacy, and safety of catheter ablation for human atrial fibrillation. Circ Arrhythm Electrophysiol. 2010;3 (1):32–8. Cappato Riccardo, CalkinsHugh, ChenShih-Ann, DaviesWyn, IesakaYoshito, KalmanJonathan, KimYou-Ho, KleinGeorge, PackerDouglas, SkanesAllan. Worldwide survey on the methods, efficacy, and safety of catheter ablation for human atrial fibrillation. Circulation. 2005;111 (9):1100–5. Di Biase Luigi, BurkhardtJ David, MohantyPrasant, SanchezJavier, HortonRodney, GallinghouseG Joseph, LakkireddyDhanunjay, VermaAtul, KhaykinYaariv, HongoRichard, HaoSteven, BeheirySalwa, PelargonioGemma, Dello RussoAntonio, CasellaMichela, SantarelliPietro, SantangeliPasquale, WangPaul, Al-AhmadAmin, PatelDimpi, ThemistoclakisSakis, BonsoAldo, RossilloAntonio, CorradoAndrea, RavieleAntonio, CummingsJennifer E, SchweikertRobert A, LewisWilliam R, NataleAndrea. Periprocedural stroke and management of major bleeding complications in patients undergoing catheter ablation of atrial fibrillation: the impact of periprocedural therapeutic international normalized ratio. Circulation. 2010;121 (23):2550–6. Patel Dimpi, BaileyShane M, FurlanAnthony J, ChingMarilou, ZachaibJonathan, Di BiaseLuigi, MohantyPrasant, HortonRodney P, BurkhardtJ David, SanchezJavier E, ZagrodzkyJason D, GallinghouseG Joseph, SchweikertRobert, SalibaWalid, NataleAndrea. Long-term functional and neurocognitive recovery in patients who had an acute cerebrovascular event secondary to catheter ablation for atrial fibrillation. J. Cardiovasc. Electrophysiol. 2010;21 (4):412–7. Medi Caroline, EveredLisbeth, SilbertBrendan, TehAndrew, HalloranKaren, MortonJoseph, KistlerPeter, KalmanJonathan. Subtle post-procedural cognitive dysfunction after atrial fibrillation ablation. J. Am. Coll. Cardiol. 2013;62 (6):531–9. Merchant Faisal M, DelurgioDavid B. Catheter ablation of atrial fibrillation and risk of asymptomatic cerebral embolism. Pacing Clin Electrophysiol. 2014;37 (3):389–97. Vermeer Sarah E, PrinsNiels D, den HeijerTom, HofmanAlbert, KoudstaalPeter J, BretelerMonique M B. Silent brain infarcts and the risk of dementia and cognitive decline. N. Engl. J. Med. 2003;348 (13):1215–22. Bunch T Jared, CrandallBrian G, WeissJ Peter, MayHeidi T, BairTami L, OsbornJeffrey S, AndersonJeffrey L, MuhlesteinJoseph B, HorneBenjamin D, LappeDonald L, DayJohn D. Patients treated with catheter ablation for atrial fibrillation have long-term rates of death, stroke, and dementia similar to patients without atrial fibrillation. J. Cardiovasc. Electrophysiol. 2011;22 (8):839–45. Hunter Ross J, McCreadyJames, DiabIhab, PageStephen P, FinlayMalcolm, RichmondLaura, FrenchAntony, EarleyMark J, SportonSimon, JonesMichael, JosephJubin P, BashirYaver, BettsTim R, ThomasGlyn, StaniforthAndrew, LeeGeoffrey, KistlerPeter, RajappanKim, ChowAnthony, SchillingRichard J. Maintenance of sinus rhythm with an ablation strategy in patients with atrial fibrillation is associated with a lower risk of stroke and death. Heart. 2012;98 (1):48–53. Blackshear J L, OdellJ A. Appendage obliteration to reduce stroke in cardiac surgical patients with atrial fibrillation. Ann. Thorac. Surg. 1996;61 (2):755–9. Reddy Vivek Y, DoshiShephal K, SievertHorst, BuchbinderMaurice, NeuzilPetr, HuberKenneth, HalperinJonathan L, HolmesDavid. 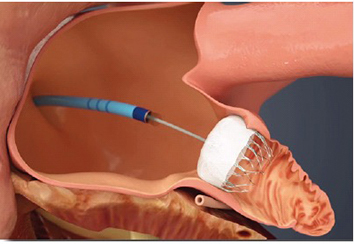 Percutaneous left atrial appendage closure for stroke prophylaxis in patients with atrial fibrillation: 2.3-Year Follow-up of the PROTECT AF (Watchman Left Atrial Appendage System for Embolic Protection in Patients with Atrial Fibrillation) Trial. Circulation. 2013;127 (6):720–9. Reddy Vivek Y, SievertHorst, HalperinJonathan, DoshiShephal K, BuchbinderMaurice, NeuzilPetr, HuberKenneth, WhisenantBrian, KarSaibal, SwarupVijay, GordonNicole, HolmesDavid. Percutaneous left atrial appendage closure vs warfarin for atrial fibrillation: a randomized clinical trial. JAMA. 2014;312 (19):1988–98.